I don’t know or care when summer actually begins proper. To me, it isn’t summer until several things happen: I pop on my shorts for the first time, I listen to N.W.A’s Straight Outta Compton all the way through, I crack the season’s first icy smooth Arizona Green Tea, and – a more recent addition to the ever-growing list – I dust off the Xbox 360, slip in Red Dead Redemption, and dive into the frontier life, free and easy on the open plains of the Wild West.There are far too many games across far too many platforms from far too wide a spectrum of years, genres, and styles for me to choose a favourite, or even approach a Top Ten. But I know this: Red Dead would be a strong contender for that lofty first place podium. It’s made by Rockstar Games, the same company who let me launch a sports car into an office building in Grand Theft Auto or uncover dope-smuggling rings from the comfort of my three-piece suit in L.A. Noire. They’re famous for their open-world designs, which give players a massive sandbox world to romp around in. Many people feel that the main appeal of Rockstar games is their pure fun factor: the focus on screwing around aimlessly and hurting innocent virtual people. While I agree that this is a) hilarious, b) super fun, c) potentially damaging to underage players, and d) indicative of negative cultural trends including but not limited to a desensitization to media violence, I feel that by isolating this aspect, players (and insane non-players who like to talk about things they don’t understand) are severely missing the point. Rockstar Games’ games, and Red Dead Redemption in particular, contain some of the best writing I’ve seen in gaming, matched only in its own era by Ken Levine’s sublime Objectivist masterwork Bioshock. The protagonist – the character you control – is always a flawed and complex human being, with conflicting motivations and an uncertainty about their place in the world. There is always a cast of colourful and memorable characters, brought to life through peerless dialogue and voice acting. There is hugely impressive production value, a vast world to explore, and a degree of polish unrivalled in gaming. All of this and more is true of Red Dead. The game is set in 1911, in the American Southwest. The old West is dying, and as power cables sprout up across the landscape, a host of new and strange evolutions are taking place. 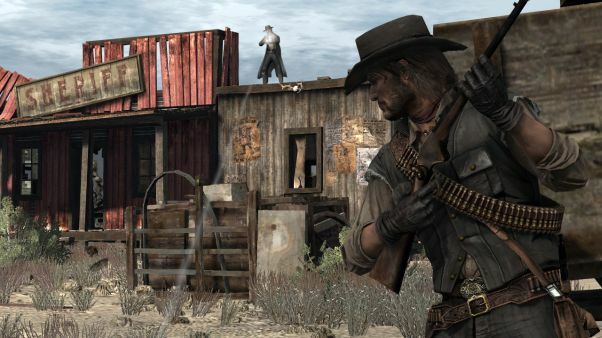 You play as the affable and battle-scarred John Marston, a former outlaw who has done his best to leave his life of crime behind, and settle down on a ranch with his family. As is predictably the case, however, his past lurches out to drag him back into it, and the corruption he faces comes on all sides – including from his own government. As Marston, you struggle not only with the morality of a life on the open plain, but with the ways in which the West is changing – and the ways in which it’s still as brutal and wild as ever. Story aside, Red Dead is pure, distilled fun. The West comes alive in the game’s gorgeous landscapes, dotted with cacti, vegetation, and crumbling mesas. Small towns and settlements are splashed here and there, and between them is nothing but pure expansive frontier, teeming with wildlife both beautiful and dangerous. Bandits, crooks, thieves, lawmen, clergymen, soldiers, tavern wenches, snake oil salesmen, and cowpokes of every description are everywhere and anywhere. And when you’re not interacting with them through the story, they’re playing out their own Louis L’Amour adventures, completely independent of what you’re doing. 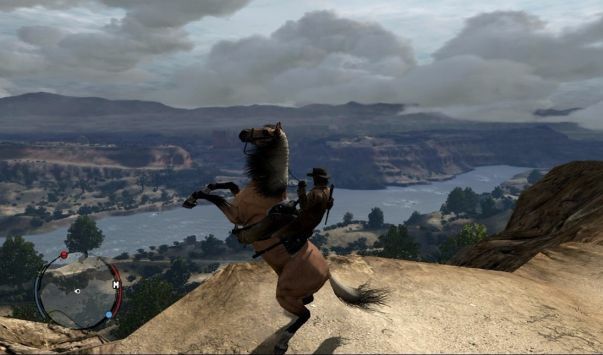 Random encounters and unpredictable systemic events are all over the place in this game – a common enough design element nowadays, but fresh and exciting when Red Dead was new in 2010. You’ll be riding on horseback, and see a stagecoach at the side of the road where an innocent woman is being robbed by banditos. Sometimes you’ll stop, and they’ll attack. 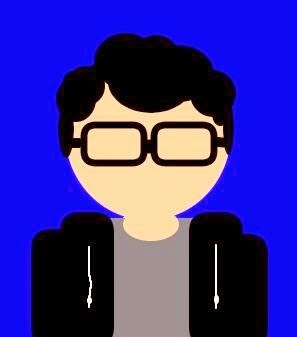 Sometimes you’ll stop, and they’ll ask for your help. Sometimes you’ll stop, and the woman will pull a gun and try to rob you. The West is a dirty place, after all. What I love most, though, is the bang you get for your buck. You get an incredible story, yes. You get a living, breathing Western world to mosey through, as populated with danger and adventure as you could possibly want. You get great graphics, great sound, great music, great dialogue, and super-polished gameplay (firing a pistol, riding a horse, and hog-tying a crook feel as natural as huffing into a spittoon). But that doesn’t even scratch the surface of all you can do: if’n yer a gamblin’ sorta man, you can partake in all sorts of games of chance, from high-stakes poker to five-finger fillet. You can chase, break, and tame a veritable rainbow of wild horses. You can hunt all kinds of game, from the humble armadillo to the elusive cougar, and even the proud, fading buffalo.You can liberate the land of the scourge-like bandit bands strewn across it, or rise through their ranks and rule like a road rustlin’ king. You can hunt for hidden Confederate gold, or even – get this – pick flowers. You could spend hundreds of hours doing new and exciting things. You can do almost anything you want, in true Rockstar fashion. This is why I love this game so much, and why it’s become a hazy, sticky, hot-July-afternoon tradition: it makes me feel like a real buckaroo. And in a world of fast-track, make-a-buck, creatively-bankrupt, mass-market chaff, that makes for an experience well worth revisiting again and again. "...in a world of fast-track, make-a-buck, creatively-bankrupt, mass-market chaff, that makes for an experience well worth revisiting again and again."